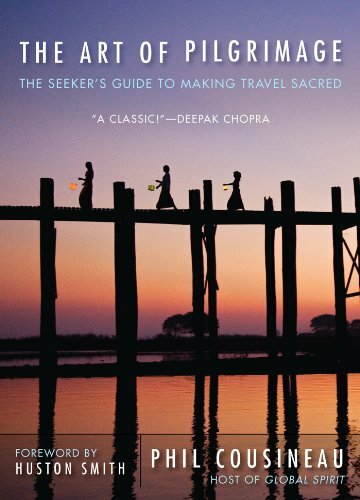 Few books have continued to inspire my life of art/travel/spirit like Phil Cousineau’s The Art of Pilgrimage. I bought the first edition back in 1998 and 20+ years later there are more post-it flags than pages. Phil was an early student and then collaborator with the great, late Joseph Campbell. In this book he uses the analogy of the Hero’s Journey as a guidebook for traveling in a deeper, more sensitive and sensory way. When I lose my way somewhere along the road, I reach into my pack and find this evergreen book (now always with me on my Ipad). My digital book makes for easy access, scanning the highlights and getting right to the heart of why we travel. His insights never fail to reinvigorate my travels with deeper purpose and wonder. So how does Pilgrimage differ from ordinary travel? The simple answer: Pilgrimage is regarded as the universal quest for the Self. We travel so that we can know ourselves out of context from our familiar surroundings. It’s an inward and outward sacred journey of discovery. The creative process is also such a journey. We venture out into the unknown. We take great risk, and without knowing it, follow the archetypal journey of the Hero. I have taught workshops using the classic stages of the Quest to illustrate how our human longing for Self can lead us to our most authentic voice. In my upcoming classes in Boulder, Colorado (see below), I focus on the stage of the journey called The Way. After the initial stages - Longing, The Call, and Departure - we push off from the shore and begin. This is where we must strengthen our internal compass in order to find True North, listening deeply to the subtle beckoning. This requires tremendous faith, a muscle that is strengthened through practice. The Art of Pilgrimage has given me a store of insight and inspiration to understand these different stages of the journey, and to use them as teaching tools in my classes. I highly recommend this book as your traveling companion at home and on the road. It will keep you steady on your course in life and art.